Podium Potential Academy athletes Maeve Plouffe (SA) and Luke Plapp (VIC) celebrated maiden individual national crowns in the elite individual pursuit. Plouffe, 19, a three-time national champion in the team pursuit and Madison events, was commanding in her five-second victory (3:38.856) over fellow Academy member Sam De Riter (VIC/3:43.042). Victorian Ruby Roseman-Gannon joined the pair on the podium beating Lauren Perry (TAS) for bronze. The race of the day came in the elite men’s final with Luke Plapp (4.22.964) surging in the final lap to steal the gold from Queensland’s Blake Quick (4.23.962). Jarrad Drizners (SA) finished third with a time of 4 minutes 24.263 sec. “It is a pretty unreal feeling, it was awesome to share the podium with Blake and Jarrad,” said Plapp, 18, who is making his debut in the elite ranks after dual junior world titles in 2018. 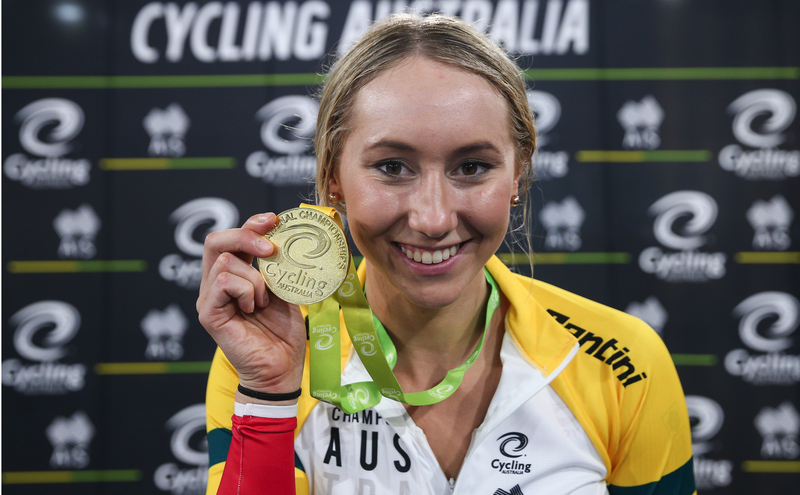 Just a few weeks after her triple World Championship medal haul, Sydney’s Kaarle McCulloch claimed a thirteenth career national title, her fifth time trial crown. The last of ten riders to take to the start line, McCulloch clocked 34.185 seconds, over half a second ahead of Victoria’s 2016 champion Caitlin Ward (34.727). Queensland’s Lara Tucker used the parochial home crowd to her advantage as she took bronze in a time of 35.624 seconds. “I am a bit surprised with that ride actually, it shows my form hasn’t dropped off too much since the World Championships, but that hurt a lot more than the worlds, let me tell you,” said McCulloch, 32, who first claimed the event eleven years ago in 2008. “Clearly the form isn’t 100% straight off the back of the World Championships, but you have to put yourself in a situation where it is challenging, where you are under pressure and you have to execute. The elite men’s sprint qualifying got underway on day one with Nathan Hart (ACT) topping the Flying 200m times with 9.762secs ahead of Conor Rowley (VIC/9.943), Tom Clarke (SA/9.995), Matthew Richardson (WA/9.995) and Patrick Constable (SA/10.017). The men’s sprint concludes on Thursday evening. In the under 19’s category, the battle for the men’s team pursuit title set an exciting tone for as Victoria’s Graeme Frislie, Joshua Heather, Harry Morgan and Bill Simpson (4:07.679) edged out Queensland’s hometown quartet of Declan Trezise, Alastair Mackellar, Ethan Viviers and Liam Walsh (4:07.831) by one-tenth of a second to claim the green and gold jersey for a fourth straight year. South Australia (4:11.029) took out bronze. In the under 19 women’s final, Queensland’s Emma Green, Liliana McLennan, Lauren Robards and Francesca Sewell donned the green and gold champions jersey in front of a home crowd after catching their Victorian opponents Keely Bennett, Sarah Doyle, Ashley Jones and Elizabeth Nuspan inside the final few laps. South Australia caught New South Wales in the race for bronze. South Australia claimed the double in the team sprint with Heather May and Tia Slama (36.081) taking gold by three-tenths of a second over New South Wales (36.443) with Queensland (37.161) taking bronze. Carlos Carismo, Declan Key and Jaden Rollison (46.982) won the under 19 men’s event by half a second over Queensland’s Declan Trezise, Duncan Allen and Brandon Hutton (47.498) while New South Wales claiming bronze (49.231). A spontaneous mid-race blood nose didn’t slow down South Australia’s Ella Sibley who took out the crown in the under 19’s scratch race. The incredibly uncomfortable situation did not stop her crossing the line ahead of Victoria’s Elizabeth Nuspan and South Australian Katrina Chung-Orr who closed out the podium. Victoria’s Graeme Frislie went on to claim his second national title of the night, crossing the line in 11 minutes 54.76 sec in the men’s scratch race. New South Wales pair Rohan Haydon-Smith and Kurt Eather rounded out the podium finishing second and third respectively. The Championships is also part of the Brisbane Cycling Festival which runs March 26 – April 14. Catch all the action from #TrackNats on Cycling Australia’s facebook stream or on the Kayo Sports App. Thursday 4 April: Session Times 12.00pm & 6.30pm: Six titles will be on offer on day two including the men’s sprint, plus under 19 individual pursuits and sprints. The women’s sprint qualifying also gets underway during the evening session. Watch for Nathan Hart (ACT), Pat Constable (SA) and Matthew Richardson (WA), plus Kaarle McCulloch (NSW) in the sprint. 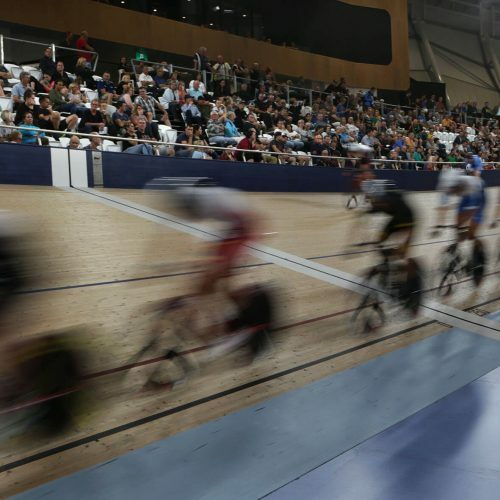 Friday 5 April: Session Times 2.00pm & 6.30pm: A fast and furious Friday will see ten finals across two sessions at the 2019 #TrackNats with the elite women’s sprint, elite scratch races, elite men’s and under 19 time trials, plus the under 19 keirin finals. Watch for Sam Welsford (WA) in his rainbow jersey in the scratch race in the evening session. Saturday 6 April: Session Time 11.30am: The 2019 #TrackNats will conclude with a bang on Saturday afternoon with six finals including the elite keirins and points races, plus the under 19 men’s and women’s Madisons. Watch for Alex Manly (SA) in her rainbow jersey in the points race in the evening session.